Today, three in four (77%) vets believe pet obesity is on the rise. Despite pet obesity being a potentially life-limiting condition, new research by the Pet Food Manufacturers Association (PFMA), principal trade body for the UK pet food industry, reveals two in three (63%) owners feel more important problems face their pets. 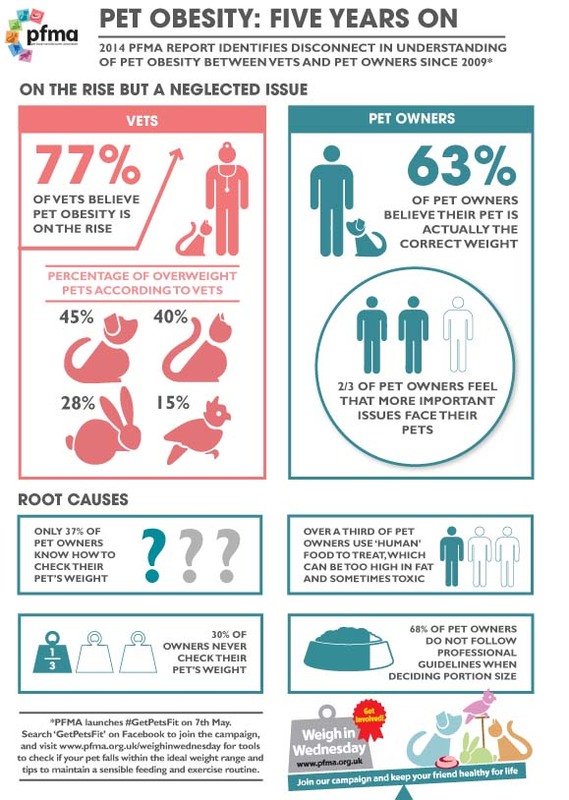 Vets consider the root causes of pet weight gain to be owners not following feeding guides (72% re cats, 60% re small furries and 28% re birds), treating with leftover food (78% re dogs) and insufficient exercise, particularly for cats (46%), dogs (44%) and small furries (35%). PFMA’s ‘Pet Obesity: Five Years On’ research arrives five years after its previous report, allowing pet owners and professionals to see how the needle has moved, gauging whether Britain is winning regarding pet slimming. New findings show that although pet owners’ awareness of pet obesity has improved, cause for concern remains – while vets feel up to 45% of all pets they see are overweight (45% of dogs, 40% of cats, 28% of small furries and 15% of caged birds), two in three (63%) pet owners believe their pet is the correct weight. The vast majority (93%) of pet owners say they would be concerned to discover their pet is overweight, yet only one in three (37%) know how to check this, indicating that existing tools and guidelines are simply not getting enough cut-through. PFMA is calling for pet owners to resist overfeeding and excessive treating, both heavy contributors to pet obesity – currently, two in three (68%) pet owners do not follow professional guidelines when deciding portion size, with 30% taking a cavalier approach relying on instinct. This needs to change. Vets advise that treats should be fed occasionally and be taken into consideration at meal times, reducing the regular pet food ration accordingly. Whether consisting of dried, moist or a mixture of these foods, a daily diet suited to a pet’s life-stage and adhering to professional feeding guidelines is the best way to ensure pets receive optimum nutrition. Worryingly, nearly half (48%) of owners are feeding pets treats more than twice a day, unknowingly putting them at risk. One in three (36%) pet owners are using ‘human’ food to treat, but such treats are often unsuitable – some healthy human food treats (such as vegetables for dogs) are suitable, but others can be too high in fat and sometimes toxic (such as chocolate, onions and grapes). As with humans, supporting diet with exercise is key in tackling pet obesity. Vets recommend exercise of at least 30 minutes twice daily for adult dogs, forty minutes daily for cats (particularly indoor cats) and four hours daily for rabbits – although the level of exercise required for any pet will also depend on its age, breed and health. Owners should always seek vets’ advice on this, as – for example – certain dogs may need longer, more vigorous walks. Encouragingly, nearly one in three (31%) owners currently provide up to an hour’s exercise a day, though there is a serious shortfall for rabbits and birds (with 69% and 78% of their owners believing no exercise is necessary, respectively). Three in four (78%) UK vets are running obesity clinics with high success rates (49.5%). All vets welcome questions from owners about their pet’s weight and will offer guidance on how best to stay on track. In addition, extensive pet weight management resources – including Pet Size-O-Meters and details of PFMA’s annual Weigh in Wednesday initiative – are available here. Further inspiration can be found and shared on the #GetPetsFit campaign Facebook page. Taking its latest pet owner and vet findings into account, PFMA suggests that controlling portion size and monthly weighing or measuring are priority for any owners wanting to prolong and improve their pet’s life. The Pet Food Manufacturers’ Association (PFMA) is the principal trade body representing the UK pet food industry, its 70 members accounting for over 90% of the market. PFMA aims to be the credible voice of a responsible pet food industry. While striving to achieve a balanced regulatory environment for the production of nutritious and safe food, PFMA also encourages responsible pet ownership working in partnership with relevant pet bodies. It aims to be the main resource for its members, general public and others as well as playing a lead role in forming opinions in Europe through the European Pet Food Federation (FEDIAF). For more information visit www.pfma.org.uk. Did you pick a diet food yourself or were you advised to feed this way? What a great infographic, it makes it so easy to understand the issue. See we don’t have any pets because we are worried about not looking after them properly. I hate seeing dogs waddling along, all over weight. I really feel for them. I’m sure their owners think they’re just spoiling them with love and yummy food but it’s so sad and they just look so unhealthy. I do think it’s sad to see an overweight pet, rather like an overweight child to be honest, there’s no excuse for it. I think we might all be surprised though. We do take our dog regularly to be weighed and he’s definitely on the upper end of the scale! But at least you are aware of the problem and monitor it. Our Lilly is on a heavy side as well but we try our best to fix it. I’ve never really thought much about obese pets, its so sad to think of animals suffering because we aren’t regulating their intake properly. Some very useful info here. It is a huge problem… just not a lot of talk about it, which is a shame. I’ll have to show this to my husband – he’s forever giving treats to our dog and cat. Thank you for highlighting this issue. It is terribly sad when people overfeed their animals. Overfeeding is one problem but lack of exercises is the other. I know some pet owners who walk once a week – Sunday family walk… how bad is that? I rescued a very overweight dog and she did eventually slim down although I lost her to cancer a couple of years ago and I wonder if all those years she was overweight before I had her had contributed. Very sad. It is so important to measure food out. We have a measuring cup we got from the vets for dried food that is really useful. Thanks for an informative post. With Newfs, we’re incredibly careful to ensure they’re not a single pound overweight. Ouch. Thankfully by boys and the pup are not obese although I am! I couldn’t think of anything worse than allowing my puppy to become over weight, would be such a shame as he would definitely be more uncomfortable as he is so small, it’s common sense really and some people can be quite cruel by excessively feeding with minimal exercise. It’s as bad as neglecting in my opinion. Totally agree with you Gemma. Keeping good weight of your pet suppose to be a part of being a responsible pet owner. I always think it’s really sad when I see overweight pets. Overfed animals don’t have the same quality of life and it’s terrible that owners allow it to happen. Sometimes they put weight so fast you really have no idea when did it all happen…. and then it takes ages to get it back down. Because our dog is getting on now and struggles to walk far I am really aware of the treats she is given and will very rarely give her leftovers these days. I guess if they are less active they have to eat less. Try natural treats like carrots maybe… if you dog likes it… no fat there and they can have some fun (use boiled one if raw are to hard for older dogs). Interesting post. Just from being out dog-walking and not having undertaken any research, I would agree with that pet obesity is on the rise. It’s so sad to see so many overweight animals struggling.